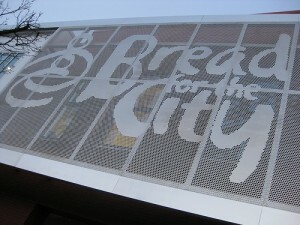 Yesterday, I published a slideshow from Bread for the City’s January 7 grand opening. I also posted the first part of an interview with the non-profit’s Executive Director, George A. Jones. More of my conversation with Jones is below; in it, he discusses how the expansion of the group’s Shaw location will facilitate an expansion in their services–as well as how you can help. There are two major ways: volunteer or give. We accept cash contributions and in-kind contributions of donated food and clothing. When it comes to people’s cash donations 90% of every dollar goes to our five core services. A lot of people like to have tangible connections to our programs so we encourage them to do food drives. We have 5-10 volunteers on a given day; there are scores of people looking to do community service, including kids or teens for school. They can develop food drives right at their schools or boys club, girl scouts…I encourage parents to have their children do these food drives remotely and bring the food to us. We give kids a menu to try and generate certain foods, including items that are low in sodium, vegetables or non-perishable stuff, because we provide supplemental groceries designed to last three days to families whose incomes are very low–less than $7,000. They may not be on food stamps, even if they run a great risk of running out of food. These are families who are food insecure, who are at the risk of running out before the end of the month. Our food pantry was designed to support such people. Are more people receiving assistance? We just finished our holiday drive, where our goal was to feed 8,000 people. We actually served 10,000 a turkey and traditional holiday trimmings like cranberries, stuffing and vegetables. Most of our contributions came as cash but some people did food drives and came in with boxes of food. People ask me, do you want cash or should we host a food drive…there is efficiency with cash because we have systems set up so we can buy food at wholesale prices, but when people want to do something, we welcome that– coat drives, food drives…when you bring those things in, we get them in the hands of the low-income families we serve. Our big challenge right now is paying for food…our ability to get contributions to our food pantry is always a challenge. We just finished the holiday season when people give generously, but we’ll have 4,000 families every month for the other ten months of the year to provide groceries to. A third of the people in those families are children. We are serving a lot of children. There are 35,000 children at risk for hunger during the course of a year, and at Bread for the City, over a 1,000 kids benefit from food in our pantry. And 400 kids are in our pediatric practice. The typical Bread for the City client is usually distressed in one of the areas we cover…for example, they may be at risk of losing housing, so they see an attorney to get assistance. People walk through our door and tell the receptionist, “I heard Bread for the City can help me see a doctor”. We have two means tests: they need to be a D.C. resident, and they need to be low-income. We take them in to a counseling room and do an intake…it’s never the case that people have only one issue, it’s never isolated like that. During our intake assessment, we ask potential clients to talk more about what’s going on with them in a private setting. The average person we see makes less than $7,000 a year, so the income question is usually not an issue at all. We ask a battery of questions, starting with housing, medical, jobs…we try to find out what their status is, what’s happening mentally/socially/medically on their end. If a person asks about a doctor, we may also find out that they’ve run out of food so we might have them work with a social worker for a food stamp application. What new services will you be offering in your expanded facility? Two medical services we have not provided historically are dental care and a vision clinic. There are so many people who come in with chronic illnesses like diabetes, which is often coupled with vision problems. One of the challenges with a non-profit clinic like ours is that our salaries are fairly modest, so finding qualified and competent providers like Primary care providers or Optometrists is harder. It can take a while to find someone for whom working in a non-profit clinic is consistent with what their career goals are, who can afford to take a modest salary…they may have families of their own, student loans. One of the things we really think is important is that it isn’t just a matter of providing these services…Bread for the City has figured out that an important part of our formula is to serve our clients with dignity and respect. That is one of the critical ways we form relationships with the people we serve. We don’t just provide free groceries or free legal services or medical care; We do it in an atmosphere of dignity and respect that is the hallmark of the last 30 years. That atmosphere is part of the magic formula; it makes all the difference with the services we provide.